Because one of the acids in its fruit cures scurvy, oranges spread quickly through the ancient world as sailors planted these important trees at tropical ports. The orange no longer exists as a wild tree, but has become the most commonly planted fruit tree in the world, according to Purdue University. Orange groves produce more than 200 million boxes of fruit annually in Florida alone. 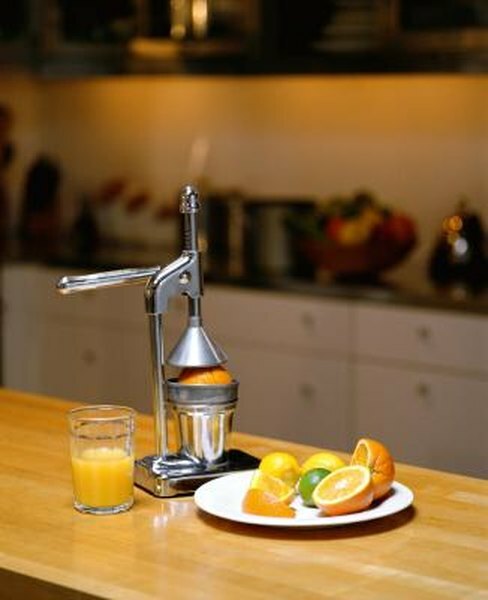 Acids in oranges provide important nourishment as well as unique aroma and flavor. If you throw away the peel and the seeds of a typical Florida-grown orange, you'll still find 63.5 mg of ascorbic acid in the fruit you keep. You could eat everything but the seeds and add even more vitamin C, for a total of 112.9 mg. Men older than 18 need at least 90 mg per day, and women over 18 require 75 mg. Two peeled oranges will exceed your minimum needs for vitamin C. If you fall short of this vitamin you won't immediately suffer full-blown scurvy, but many people today do suffer from vitamin C deficiencies. Symptoms include bleeding gums, scaly skin and nosebleeds, according to the University of Maryland Medical Center. Oranges also contain significant amounts of vitamin B9. Folic acid, or folate, helps you produce energy by transforming complex carbohydrates into the glucose your muscle cells burn as fuel. Folic acid also maintains your mental health. Slight deficiencies of vitamin B9 cause forgetfulness and irritability as well as physical problems. Low folic acid intake during pregnancy increases chances of birth defects such as spina bifida and cleft palate. Adults over 19 need 400 mcg every day, but pregnant women need at least 600 mcg. One peeled orange provides 24 mcg of B9. If you're pregnant, ask your doctor about adding folic acid supplements to your diet. The natural citric acid in the orange gives it a sourness that contrasts pleasantly with the sugar in the fruit. Many bottled fruit juices mimic the flavor of citrus by adding citric acid derived from fermented sugar. Soft drinks depend on phosphoric acid for that extra bite, but orange juice actually contains higher acid levels than carbonated soda, says Fred Senese of General Chemistry Online. Processed oranges supply citric acid that adjusts the acid balance in wine and adds tart flavor to sweet jams and jellies. Citric acid helps improve the flavor in everything from canned figs to fried potatoes. Oranges provide small amounts of saturated and unsaturated fatty acids and two protein building blocks, aspartic acid and glutamic acid. The fruit also contains acetic acid found in vinegar, and caprylic acid, an aromatic in goat fat. Caprylic acid's rancid smell finds application in perfume. Anthranilic acid's yellow color makes this component of oranges useful in the manufacture of indigo dyes. Formic acid found in oranges acts as a strong irritant when concentrated. Oranges contain harmless amounts of formic acid, but volatile oils in the orange rind could cause dermatitis, hives and asthmatic symptoms in some individuals.